College of Charleston professors and students would agree that attending class is crucial to a successful academic experience. In downtown Charleston, however, this is easier to say than do after a big rain, according to many CofC students. The College of Charleston is centrally located in downtown Charleston, a city with a long history of flooding. This summer and fall have seen record rainfall across much of the Southeast including Charleston, resulting in some interesting new water sports taking place on the peninsula. 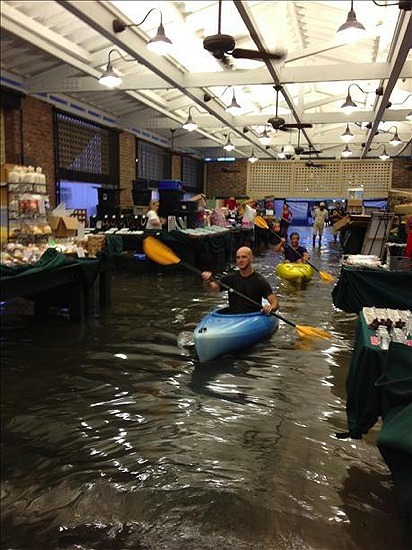 While kayaking through the City Market and ripping tricks on a wakeboard on downtown streets may be fun following significant rain events, what are students to do when the streets are impassible or their cars flooded out? “Walking home in knee deep water is disgusting and unsafe, not to mention my car has flooded since it was on the street and I don’t have a driveway,” lamented local resident Silvia Zakrewski. Charleston’s flooding problems have their roots in the historical development of the city. 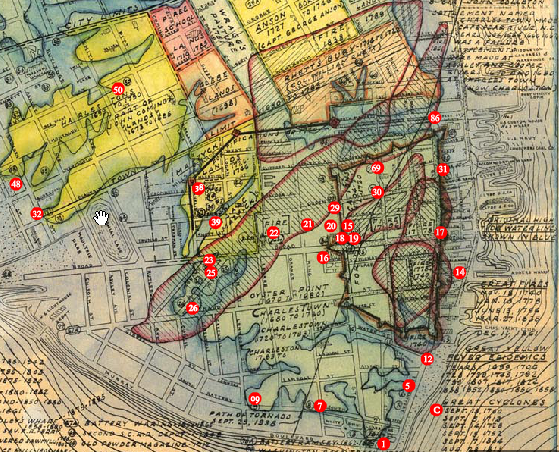 Alfred Halsey’s Charleston Map above shows the city’s historic low wetlands, areas that were filled in over time to make room for new construction and are now prone to flooding during heavy rains and high tides. The City of Charleston has a number of drainage improvement projects in the works including installation of deep storm water tunnels and pumps that will ultimately drain the streets of flood waters. Unfortunately, these improvements, the cost of which runs into the tens of millions of dollars, likely won’t be fully complete until 2020 at the earliest. Until then, College of Charleston students will have to endure the flooding and try to enjoy the occasional downtown water sports it allows. Winching the flooded streets of Chucktown with Wesley Mark Jacobson, Davey Blair and Wes Huber from Jewell&Ginnie on Vimeo.